Light, Darkness, and Balance. But how? Re: Light, Darkness, and Balance. But how? yes- and I don't think it really matters to the balance of the force, what or whoever causes it being force-sensitive or not? Them being powerful force-users makes them more dangerous because their abilities makes it easier to manipulate other beings around them? A normal dude may not have been able to deceive the Jedi and everyone around him like Palpatine did? We don't know enough about Snoke to speculate how he came to be the leader of the FO but assume his force-powers helped in the matter. Of course it's all fiction so it can be read in many different ways and I don't think LF will ever truly define what the balance really is. I am not personally expecting it to come to anything more than that. Rey opened herself up to the dark and light but ultimately protecting the light is what the ST is defining as balance, as I understand it. In fact it’s not just the ST because we have also seen this in Rebels with Kanan telling Ezra that they are the balance. I know Luke said in TLJ it was vanity to say that if the Jedi die, the light dies. But I don’t see the intention to move beyond the Jedi in the ST as Luke also said he wouldn’t be the last and Rey has the ancient texts. JJ doesn’t strike me as someone interested in doing a deep dive into force lore. We already got the basics in TLJ with Rey and Luke on Ahch-To and the light/dark/natural cycle. That was the place to expand upon it IMO if they wanted to set up some big reveal about balancing the force in Ep IX. Sharing this comment from over on Takodana general comics/books discussion to respond..
My issue isn't with the force stuff- I love the force stuff...my problem is they're repeating the same "lessons" over and over but without translating what that actually mean in universe for our characters- especially the force-sensitive ones. Regarding the bolded – I’m not at the point where it annoys me (yet) but I want this too. I am thinking we will get this in IX. I'll keep my optimism till I've seen IX haaa.. If this is not clear in IX I’ll be annoyed then. Lol. @Night Huntress wrote: I thought the scene in TLJ when Luke explains to Rey what the force is (for a lack of a better wording). I personally understood that the dark isn't something "bad" by default. It's necessary because without darkness there can be no light and the other way around. Life, death, decay- that feeds new life etc. You got me thinking about the whole light/dark/balance thing again! I’ve not gotten my head around how the concepts of dark/light and bad/good – truly fit together... Part of the reason is probably that much of what we have been told about the dark and the light has come from the Jedi order, or the Sith. But I think what you’ve pointed out- Luke's first lesson to Rey - is a pure, true description of balance- the light and the dark without a Jedi order or Sith filter. It’s really wonderful. I am not sure if this first lesson, relating to nature - and the living force, is the whole picture though – I’m not sure if there is a wider balance involved.. I have loads of questions that I don’ have answers to (and that's okay). Or, I think I may have only part of the answer to the question at this stage. It may be the first lesson is part of the answer. I wonder because Luke's first lesson leaves out some key concepts in the force that George Lucas has talked about – and that you’ve mentioned (selfishness vs selflessness).. but more about this below..
@Night Huntress wrote: Luke said to Rey the Jedi were wrong - their hubris lead to their downfall. But I miss someone actually pointing out what could've been done differently. What's even the definition of "light" or "dark"- for me it's only the motivation behind your actions. Is ist something selfless, or self-serving...and these lines could be blurred. What the Jedi order could have done differently is a cool topic. a massive question! 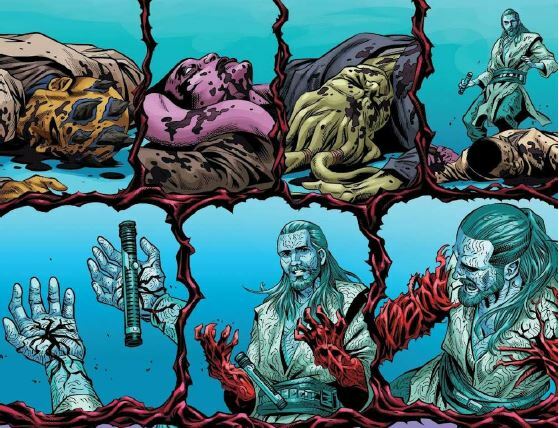 Apparently there was something in the recent Vader comics about the Jedi order and the greater cause that painted them in a very dim and callous light. but I'm yet to read it soooo can't draw on that yet! I think the Jedi order extreme of aiming to extinguish the dark and eventually believing that they were the owners of the light side of the force, they became arrogant - this was really the heart of their failure. They were not all bad though..
@Night Huntress wrote: The same with all the emotions Jedi condemn as "dark". Fear, anger, attachment, aggression etc.- these feelings are all necessary for sentient beings. So instead of rejecting these feelings they should've learned to deal with them in a healthy way. The same of course for the Sith/dark siders- they refuse emotions like compassion, love etc. because they think it's making them weak. The Jedi & the Sith/Darksiders are both extremists in my opinion. The balance is (imo) embracing all emotions, good or bad- but not letting them define you as a person. And from all the hints we get in canon they still seem to shy away from admitting the darkness isn't always BAD. I hoped something along this would be in those Jedi-Books but a seriously doubt it. @Night Huntress - Pretty much everything you’ve shared sounds good to me! Both the Jedi order and the Sith had a strange relationship with emotions – either letting them run the show, or disregarding them completely – it is in a way, an example of a lack of balance! A balance between these two views of emotion would be a health ideal. I don’t know if you guys have heard of decision making and the ‘wise mind’ – but there is an emotional mind, and a rational mind. The wise mind combines parts of the two. The sith were the emotional mind only, the Jedi order were the rational mind only. I find it so interesting that neither of the extremes really valued loving personal relationships.. I wonder if that is more balance. The Jedi order had compassion – but this not really a personal form of love, it’s a general form – with no attachment. I could get into looking closer at the Sith and the Jedi order but to keep this reply focused – I’ll focus on the light and the dark. Your comment that the darkness ‘isn’t always BAD’ is spot on I think – I am not clear on how this works yet, because I can see the dark does tend toward evil- and can corrupt in a way the light does not. I think Kylo/Ben is still on the dark side, and he does need to move away from the dark back to the light – but this does not mean he can’t have some dark in him. It could be that the dark is okay when it is filtered through the light side or something – I’m not sure! In search of some answers.. I've been hunting for sources of information about the dark and the light - aside from Jedi or Sith. This is a 2010 George Lucas interview – he is speaking at a Clone Wars writers meeting about the force (yes that is young Dave Filoni!). I think this is solid information – right from the original source. Obi-wan “Vader was seduced by the dark side of the force. [See clip with Yoda talking to Luke on Dagobah. George continues: “The core of force: I mean, you’ve got the dark side and the light side. One is selfless, one is selfish. And you want to keep them in balance. What happens when you go to the dark side is that it goes out of balance and you then get really selfish and you forget about everybody and you ultimately lead(?) yourself. Because when you get selfish you get stuff. You want stuff, And when you want stuff and you get stuff then you are afraid somebody is going to take it away from you. Whether it’s a person or a thing, or a particular pleasure, an experience. Once you become afraid somebody is going to take it away from you, or you’re going to lose it, then you start to become angry. Especially if you are losing it. That anger leads to hate, and hate leads to suffering, mostly on the part of the person who is selfish. Because you spend all your time being afraid of losing everything you’ve got. Instead of actually living. Where joy, by giving to other people, you can’t think about yourself, and therefore there is no pain. But the pleasure factor of greed and of selfishness is a short lived experience, therefore you are constantly trying to replenish it but of course the more you replenish it the harder it is to, so you have to keep upping the ante. You’re actually afraid of the pain of not having the joy. So that, is ultimately the core of the whole dark side, light side of the force. And everything flows from that. Obviously the Sith are always unhappy. Because they never get enough of anything they want. Mostly their selfishness centres around power and control. And the struggle is, are we suppose to let go of all that stuff. Of course that is the problem of Anakin ultimately – that you are allowed to love people, but you are not allowed to possess them. And what he did is that he fell in love and then married her, and became jealous, and he saw in his visions that she was gonna die and he couldn’t stand losing her. So in order to not lose her, he made a pact with the devil. To be able to become all powerful. George (reading from his notes): the only way to overcome the dark side is through discipline. The dark side is pleasure, biological and temporary and easy to achieve. The light side is joy, everlasting and difficult to achieve. A great challenge. Must overcome laziness, give up quick pleasures, and overcome fear, which leads to hate. (to the room) Amen. Now let us pray. (the group giggles). I think this shows that the ST hasn’t retconned the force at all. Because it was never just about the Jedi order and the Sith. With no Jedi order or Sith, there is still the force – and still the dark, the light and the need for balance. At it’s heart dark and light are about selfishness vs selflessness – about values and the heart.. 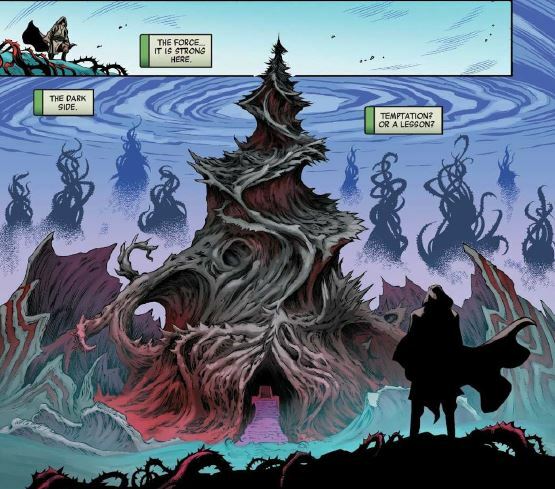 When GL expands on this – the story across the OT and the PT is laid out in pure simplicity.. and I think this all applies to the ST and gives us hints for what is ahead in IX! I feel like I could break down this interview and discuss it for a year! This is THE best summing up of what SW is all about that I’ve ever heard! And again here there is two concepts held in tension at the same time – just like balance.. The force controls us – and we have free will. We have a destiny – we can choose to follow it or not. “The core of force: I mean, you’ve got the dark side and the light side. One is selfless, one is selfish. And you want to keep them in balance. What happens when you go to the dark side is that it goes out of balance and you then get really selfish and you forget about everybody...” – I’m thinking this means the light side is where you want to stay for balance… not in the middle.. and that going to the dark side leads to imbalance. But both dark and light exist and are needed for Balance. So here maybe dipping into the dark but always staying firmly in the light (but not the extreme of trying to extinguish the dark) is where this is headed. Again there is a tension there in holding the dark and the light together in balance – the light tempers the dark maybe. Or it ‘reveals’ the corruption of the dark and therefore protects (drawing on the line from the Ancient Jedi texts that C3P0 translates!). Hmmm lol I don’t know exactly what this means – and I have played around with the idea that the dark side is not worse than the light- or that dark and light are neutral.. but I’m now thinking this doesn’t really work when looking at what GL describes. It does seem like Rey is able to dip into the dark but stay firmly in the light.. and this is similar to the concept of grey jedi.. but keeping the two sides of the force distinct. I do hope this is clarified in some lovely clear exposition in IX! Luke was right when he said the mysteries of the force are never ending! 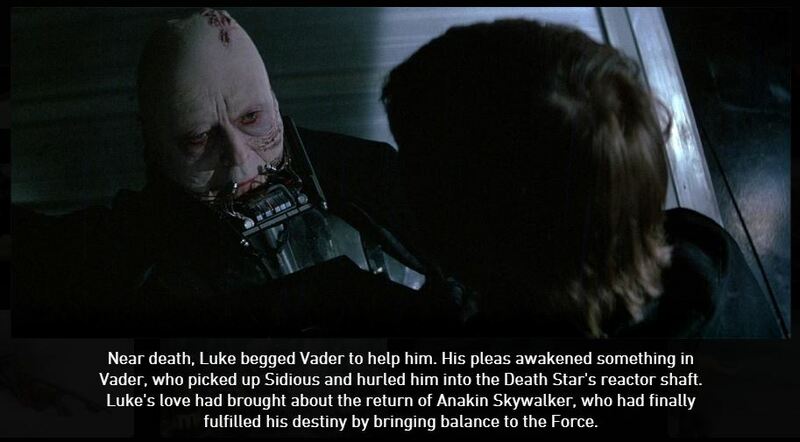 Was balance achieved at the end of ROTJ? I’ve seen this come up a few times as people process this balance stuff – it’s great to not assume and ask the question. My view is yes balance was achieved when Anakin ended the Jedi order, and then ended the Sith. For a time there was balance. Anakin was really the chosen one. It just hadn’t unfolded how the Jedi order thought it would – that the Jedi order needed to be taken out of the picture for there to be balance was just not even on their radar. 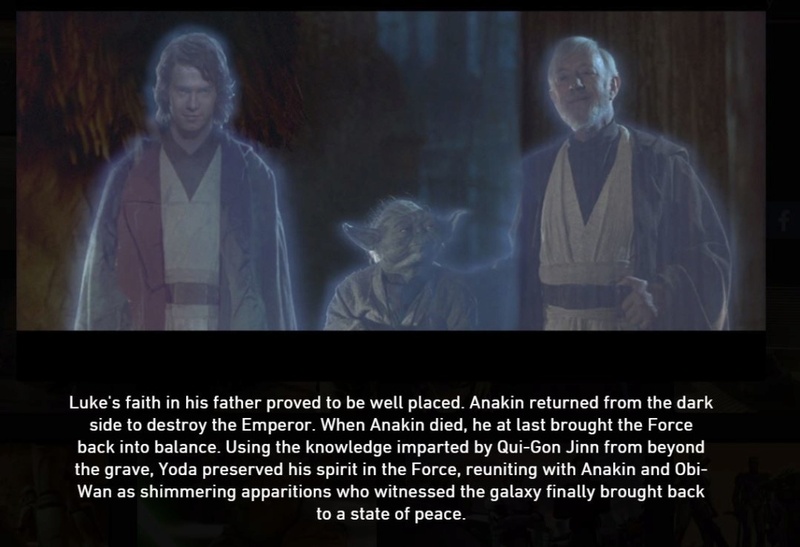 When Anakin brought the Sith to an end though, he did not 'end' the dark side of the force. It still exists because the force is both light and dark. There are now many sources supporting the idea that the force is the light and the dark and that they need to be in balance. For me, it seems from the GL interview that having a dark sider (aka 'going to the dark side') does cause imbalance. I can’t say if the amount of imbalance matters or just imbalance. I don’t think we’ve been told enough.. I tend to see balance as somewhat fleeting, rather than lasting a millennium like the Jedi seem to think it did.. but again, I don’t know enough..
@Saracene -I agree with you Saracene, I think Luke was on the money with his views on the old Jedi order needing to end – and that there was balance for a time. yeah maybe it is partly how many people you kill - the concept that Obi-wan could hear all the thousands (millions?) of voices cry out in the force when Alderaan was destroy seems to support this as being a part of all this. And all living beings together create the force - so it makes sense it would be involved. 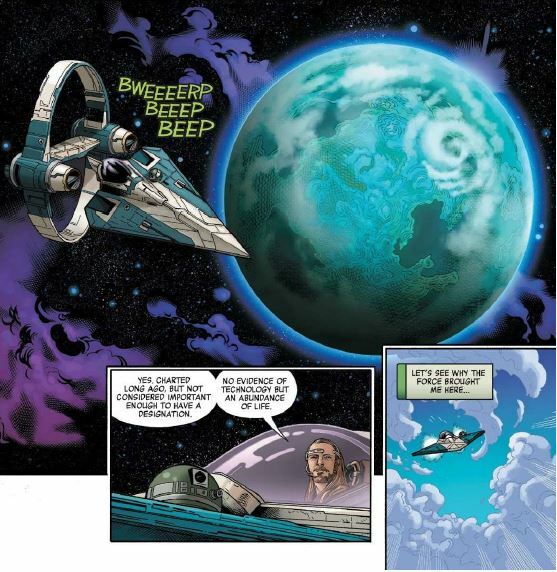 I’d be open to it not just being force users/dark siders who are selfish and causing imbalance- we’ve recently been seeing more and more reference to how the force is in all living things – the LST stuff in the poe dameron comics spoke to this.. I think force users have a unique role to play but I would not discount non-force users playing a role in balance and imbalance.. this is an interesting direction to head in if it is expanded on in IX because the Jedi and Sith were all force elite focused – it was more of that hubris Luke talked about – the Jedi do not own the force or the light.. all living beings are connected and involved - it is sooooo much bigger! @YeeRees - yeah I share your view of JJ. but I'm trying to be optimistic. It is the final movie bringing all IX movies together so in a way I don't think he can avoid the resolution of the force story.. though I don't expect to get high levels of exposition either! Very interesting how film pundits I respect - those that have seen it all with story, and should see Reylo and Bendemption from miles away, are not seeing the big picture of the ST (light...darkness...the balance). This one is now Scott Mendelson of Forbes. 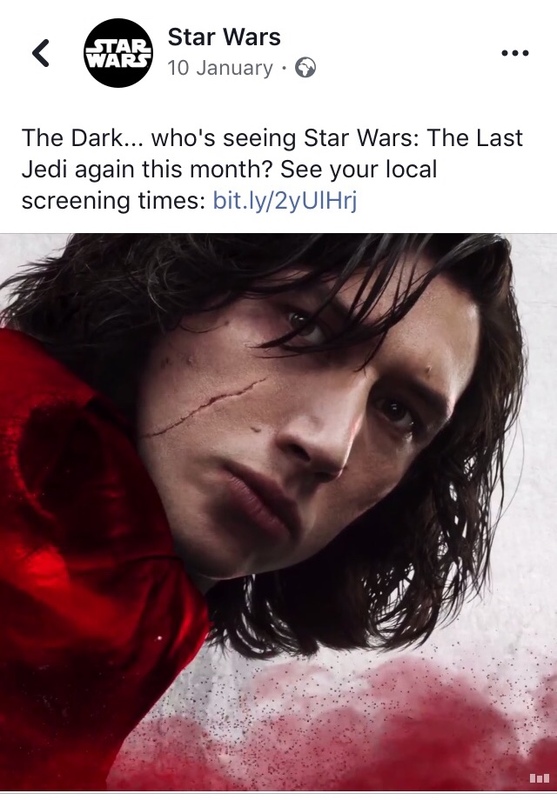 He loves TLJ, and just does not see where the story is going, yet seems game (cannot say open-minded, the article is about his opinion about IX). It's interesting how he has a general idea, which vaguely brushes upon Reylo and Bendemption, but he does not get it, either. This emphasizes why I love the ST - it is so unique, those who have seen it all in movies will be blindsided. "Why The Sequel To 'The Last Jedi' May Be The 'Dark Knight Rises' Of The 'Star Wars' Saga"
"Fair or not, Episode IX will be akin to making a sequel to The Dark Knight Rises after that film’s equally complicated reception. Putting aside its financial reception for a moment (somewhere between $750 million worldwide and around $1.6 billion, depending on if it plummets like Matrix Revolutions or rises like Return of the Jedi), the biggest challenge for Star Wars 9 will be artistically justifying itself as a trilogy capper for a saga that essentially ended at the end of the second film. Like The Dark Knight Rises and The Godfather Part III before it, Star Wars IX will have the challenge of providing an ending to a story that has already ended." @SW_Heroine_Journey - yeah!!! It's incredible how we can see it so differently! Watching a collider episode a few weeks ago my chin hit the floor when they all lamented that there were no questions waiting to be answered in episode IX. Not like JJ's mystery box with TFA. Ho hum. how boring nothing to speculate about was the verdict. eh?! There is a certain amount of hubris involved when you believe that you know everyting you need to know after only the 2nd movie in a trilogy is released. Um it seems the possibility that maybe there is a story yet to unfold that they don't know about hasn't occurred to them. I think there are more questions left unanswered at the end of TLJ - that are bigger and more interesting than who is Rey's mum or who is snoke. lol. What is going to happen in IX is a great big mystery box that seems to have gone unnoticed!! I love how the collider cries of - there is no questions left unanswered- come from the same group who were all taken completely by surprise with TLJ - didn't see it coming at all.. didn't see Kylo teaming up with Rey at all.. but they haven't learned from it - they still presume they know what is going to happen, when they had no clue for the second movie! I figure after IX, all the pieces of the story will be there for us all to join up all the dots - and the questions they didn't think big enough to ask will be answered, and the planning and flow across all IX movies and the so called lack of a coherent plan will be long forgotten. If Scott Mendelson believes there is no story to tell - then the poor person has lost hope- there is no light left in the galaxy!! 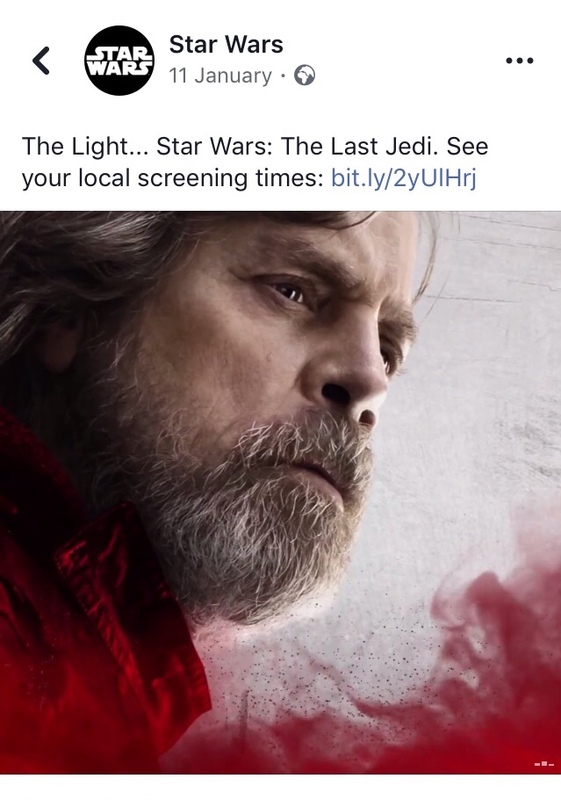 Luke's jedi show on Crait meant nothing, the resistance's survival and all the sacrifice and heroics that went into that mean nothing, oh and those slave kiddies playing with the skywalker doll probably woke up the next day and fed the doll to a farthier.. What a sad and depressing state - no wonder he thinks there won't be anything to see in IX! I'd be curious to see what he says in 508 days!! Lastly, even at the end of IX, the story will not have ended.. a particular story - the skywalker saga will have probably ended but that doesn't mean there aren't more stories to tell. I love the ideas shared in the spoiler thread about the Solo saga. Bring it on!!! ummm okay rant over. I actually find collider opens my mind to think about things from a different perspective, and I've chilled out somewhat about the jedi council. LOL. but when it comes to the ST, I'm still baffled..
@DeeBee wrote: @SW_Heroine_Journey - yeah!!! It's incredible how we can see it so differently! I will not be surprised that after viewing of IX, many of the reasonable ones (perhaps all), will say..."Wow! The Reylos and Bendemption Stans were right!" Perhaps I am being too hopeful, but I expect to see or read that from reasonable individuals. I think the public response will be a big, confusing, angry mess, but the Reylos and Rendemption stans win anyway. My worry is more that people will never let that grudge go. TPM is almost 20 years old now, and the resentment towards the prequels is still as strong as it ever was. And people didn't come to these movies to see a prince and princess/enemies to lovers romance. The filmmakers are doing a clever job at luring audiences into watching them anyway, but people don't like being tricked. Bonus anger points if the viewer also feels making Kylo the co-lead and the epicenter/love interest of the story is sexist. I feel the most bad for JJ and Kasdan, who will have a hard time convincing others that it was set up in TFA. Because you have to tell people that they're wrong and that they don't understand SW, film language, and even storytelling as a whole, and that most of the audience not only completely missed the point of the story and characters of the ST, and nobody wants to hear that. If by public, you are indicating general public, I shall respectfully disagree. I think they will love it, or shrug it off/be neutral. If by public, you are indicating the pundits (youtube, etc) - I cannot imagine all of them having such a response, yet perhaps you are correct. We all hope people will love IX and Reylo. It's just that most of the general audience, along with some of the big fans and even major publications/websites/critics as well, have no concept of where the story is going and believe there isn't anything left. Some viewers don't take confusion or being wrong very well. And that small group of angry people happen to be the loudest ones online, unfortunately. in real life I'm surrounded by family & friends who are totally GA...they like SW as a source of entertainment but they aren't what we consider "fans". 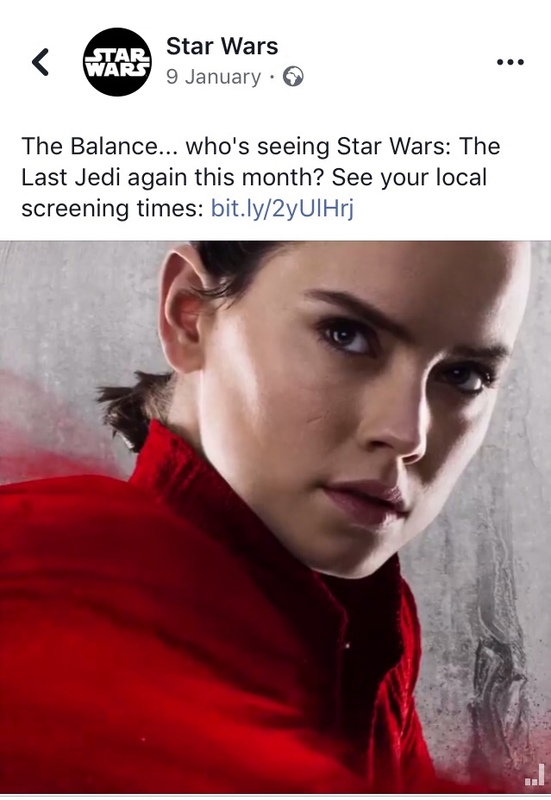 They have no idea about the drama going on in fandom or what the word "reylo" even means. They all enjoyed TLJ and looking forward to seeing episode IX. I'm not sayin they're representative of all GA but I think we have a different perception of how people think of SW nowadays because we hear & read all the negativity and it makes it seem like a much larger part of the "normal people" think that way, which I don't think its true. I think that the overall quality of the films is what matters in the long run. Misunderstandings by the public from the initial run are easily forgotten if the movie can stand the test of time based on its own artistic merits. That's why the prequels cannot be universally loved after all these years, there is simply no basis for that. Some fans can love them, yes, but objectively, they are highly flawed as films, and that will always prevent them from becoming beloved classics. The rift within the fandom, if exists, consequently is not going away. TFA is very well crafted, but fairly conventional movie, while TLJ has both brilliant, and badly executed parts. So, there is so much weight on the EpIX shoulders, as far as the future standing of the ST is concerned. If it is an artistic tour de force, there is nothing to worry about in the long run. If it is a competent film with satisfying storytelling and logical conclusion, then the fandom could rest divided based on their own tastes and preferences. Honestly, SW is so many things, and any choice of a particular perspective (e.g. war, politics, space battles vs. love story, Skywalker family, relationships between the characters) would leave someone dissatisfied. Of course, there is never a need for hatred. To remain on topic, the best bet for the positive future of the ST would be to give a really epic and satisfying conclusion in the force aspect. Light, darkness and balance - if JJ doesn't fail with that, majority of the public, be it GA or the fandom, will be happy, Reylo notwithstanding. @MaddieDove Yes, my hope is that it will be like ESB, which was very divisive at the time but is now many people's favorite. The issue that exists now is that people have the internet and social media to keep that resentment alive, as opposed to when there was just a smattering of fan magazines. TFA and TLJ have their issues, but I do hope they withstand the test of time. If we're being honest, many aspects of the OT aren't that great either, but they still hold up anyway. I have very high hopes for IX, since JJ no longer has the expectation of hewing closely to the originals to make people feel better after the prequels. He's kind of free now. 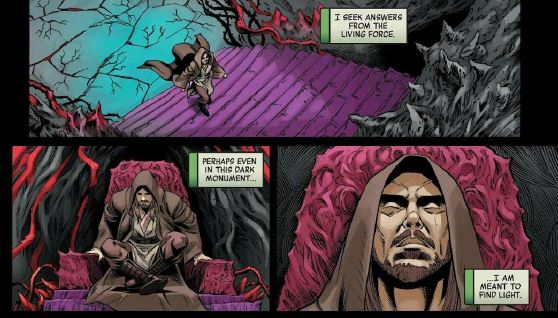 Hi all.. hope you don't mind if I geek out here and share new content from the Qui-Gon Jinn comic just released this week. I think this content about the force could be relevant to IX. Would love to hear anyone's thoughts on what this all means for IX if anyone would like to share! I'll paraphrase where I can to give context. (PM me if you want details) Skip this comment if you are intending to read this comic and don't want to be spoiled. 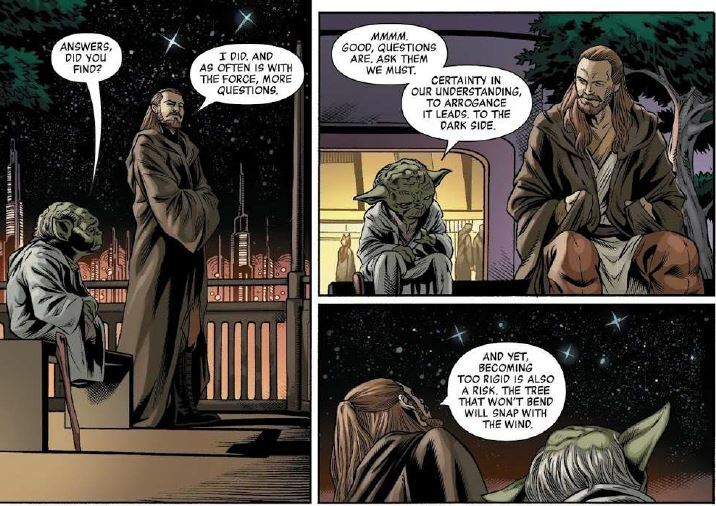 The comic opens with Qui-Gon Jinn (QGJ) and Padawan Obi-wan having gone to this planet to negotiate peace, between 'the priestess of the wood' and 'the metal clan'. The forest of the priestess of wood is under threat. The negotiations didn't end well, and under attack QGJ radios Obi-wan to come pick him and the priestess up to take them to safety. The metal clan can't harm the forest unless the priestess of the wood says they can or 'spills her blood' so QGJ forces the princess to leave - keeping her and therefore the forest safe. They head back to Coruscant. 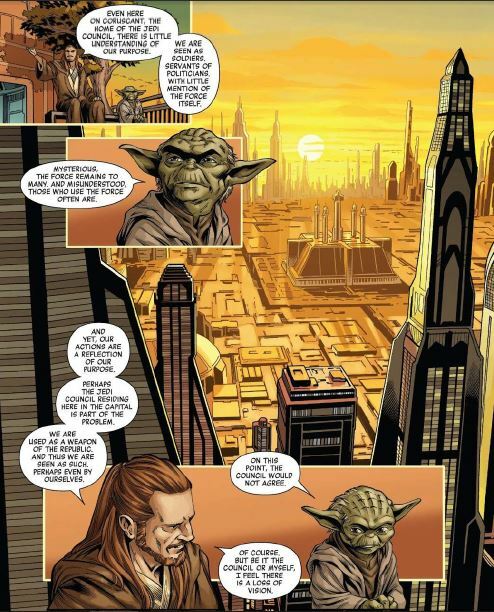 Yoda finds QGJ at the Jedi temple and they talk..
QGJ reaches out to the living force for answers.. He knows a metal city is not a place to commune with the living force, so he gets in his ship and flies off.. with the force as his guide he has no final destination in mind. "As in all things, the answers lie in the force. Letting it guide us. I just have to trust the will of the force isn't to deposit me into the heart of a star.... and that it is to find the answers that I seek. For mistress th'er as well as myself." [I like this - a very balanced statement. it is for himself, and for the priestess he is trying to help] He is eventually led to an 'undesignated planet'.. I won't include detail on this planet, but would be very interesting place for Rey and/or Kylo/Ben to visit in IX! Is it just me or would the rumoured Scottish location 'rest and be thankful' do well for this landscape? "....A beautiful place...but there must be more to it than simply -- Wait. I sense something...something feels wrong. Cold. There is a corruption here. A darkness. [the landscape around him starts to change] ... and it's spreading. Was I brought here to stop it? Or to learn from it? The force... it is strong here. ...The dark side. Temptation? Or a lesson? I see answers from the living force. Perhaps even in this dark monument... I am meant to find light." He sits... and starts to have vision. It's very tripy!!! I wish I could include the whole thing but I highly recommend if you love this force stuff you PM me to see this or make sure you get hold of it! Basically, QGJ has a vision where evil red twisted beings close in on him, and he lights his lightsaber and slays them all. Once they are all dead, they change form - and he can see they are all different species -dead. He wakes from this vision crying Nooooooo!!!! He talks to himself as he recovers from this vision "Just a vision. But what did it.. The light found its way in... balance. But through a means beyond conflict. Violence sows the seeds of the dark side. Unchecked, the Jedi could become that which we fight against." I'd love to hear what others make of this vision - it's very visual storytelling.. I'm thinking the red twistedness is the dark side. thoughts? The beautiful red blooms which the red twisted vines produce are an interesting feature - seems to me to be saying the dark side has a place, and the need for balance.. 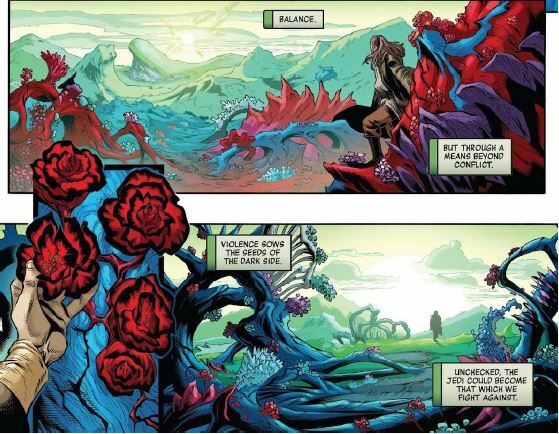 This planet reminds me a little of Mortis - very mysterious with a landscape that represents the nature of the force. tripy. I hope I've done an okay job of summarising this! 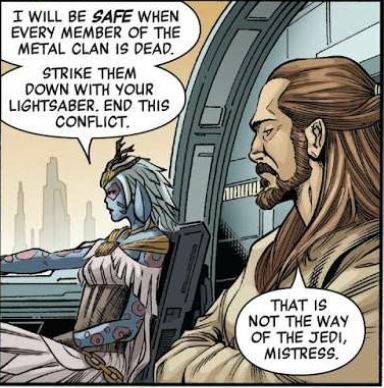 Anyway, having learned what the force wanted him to learn, QGJ returns to Coruscant and the priestess... he encourages the Priestess to reach out to outsiders and find allies who can help her.. seems the message is not to be too extreme and close yourself and your culture off, but to find balance and compromise. Love the final conclusion here - it's not about the light, the fight or the dark, it's about balance. 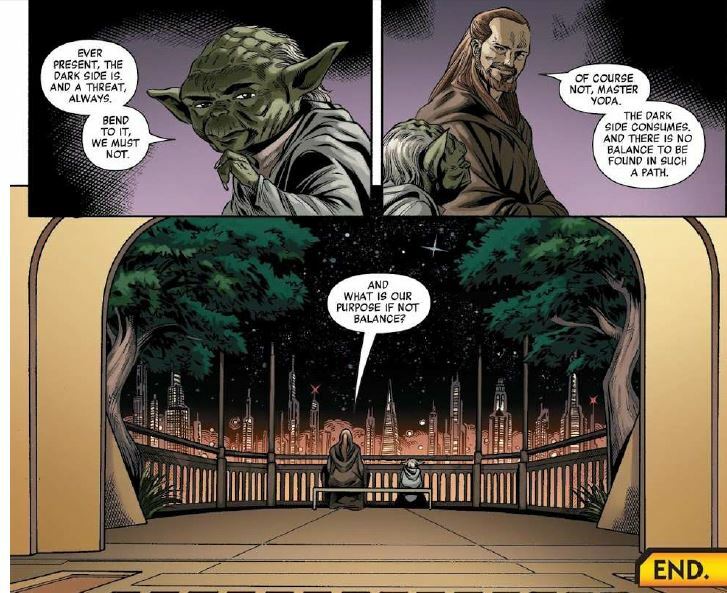 Qui-Gon was right to listen to the Will of the Force, I can see Rey taking this same approach in IX. Whether the resistance agrees with it or not. Actually maybe we already saw Rey take this approach instinctively - QGJ's vision and the planet he visits reminds me of Rey on Ach-to and her own vision she saw when the dark side gave her a lesson... anyone else reminded of that? 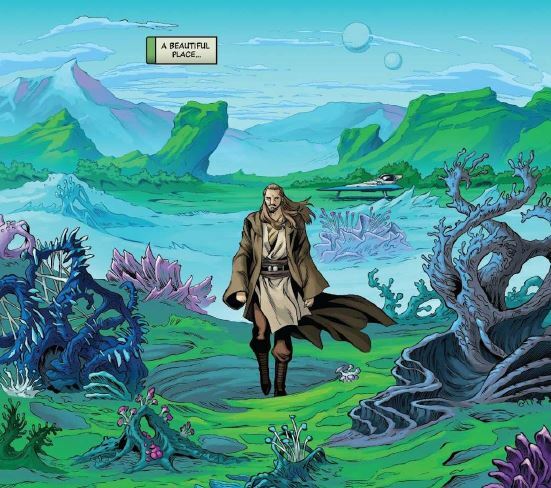 @DeeBee wrote: Hi all.. hope you don't mind if I geek out here and share new content from the Qui-Gon Jinn comic just released this week. Thanks for your assessment and thoughts on the comic. Makes me want to get it for myself to sit and read!